Here’s a lovely Old Photo of a Pretty Gypsy Girl, or perhaps a girl in Gypsy Costume! 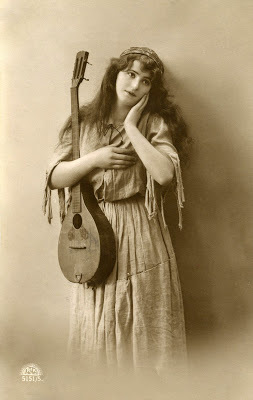 Such a classic looking Image with her Mandolin and all. This girl has such a pretty face and I love the Sepia Tones on this one! So nice for your Collage or Mixed Media Projects. You might also like another similar Gypsy Photo HERE. This is a gorgeous photo! thank you, Karen!